The following story, as originally reported by Ibn Hazm and here summarized by Louis Crompton, finishes a series (1, 2) about romantic love concepts in Arab Spain that I started one and a half years ago. Apparently the prince’s father came to disapprove of the relation with the commoner, for he exiled the poet to separate them. After his father’s death al-Mu‘tamid recalled Ibn ‚Ammar and gave him great political and military power. A famous tale, which we are not required to believe, tells how, when they were sleeping together in one bed, the poet dreamed that his lover would kill him, fled the scene, and was wooed back by the king who assured him that this could never happen. When you resembled a crescent on the sky? When you did swear that what I did was halal [permitted]! Louis Crompton: Male Love and Islamic Law in Arab Spain. In: Stephen O. Murray, Will Roscoe (ed. 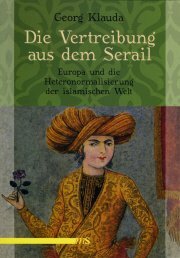 ): Islamic Homosexualities. Culture, History, and Literature. New York; London 1997. p. 151 f. — Shortened reprint in: Louis Crompton: Homosexuality & Civilization. Cambridge/MA; London 2003.